In The Sims 4 Seasons you’ll be able to play with your Sims in every season; spring, summer, fall and winter. 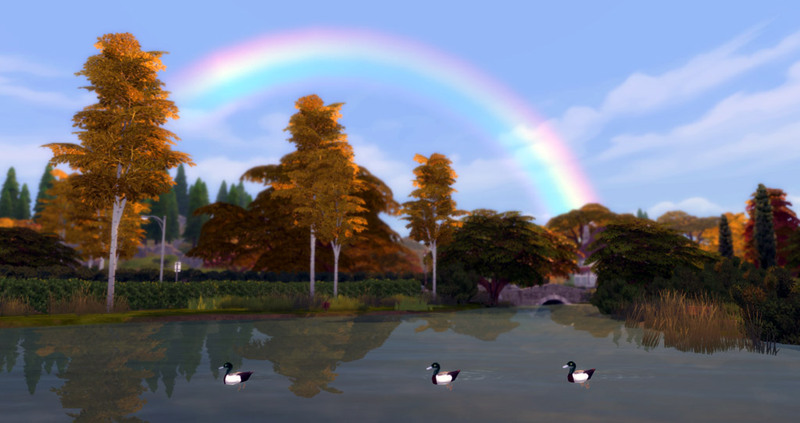 Every world you own in your game (including packs) will be affected when you combine it with The Sims 4 Seasons. If you start a new game or resume an old one you can choose in which season you’ll begin your game. Each season will last for 7 days. You can change this in your game options to 14 or even 28 days. Neighbors will react on weather, for example when it’s raining they will walk around with umbrellas. The different worlds will each have their own climate. You can have blizzards and snow in Willow Creek but you won’t find them in Oasis Springs for example. If you want to visit another world, the weather could be different there. So if you’re planning a trip it could be raining. You can always change the weather using the Weather Control Device or use cheats. The seasons are different for each world. In Oasis Springs it’s rarely cold and you won’t find bad weather here. The perfect getaway when you want to fish in winter or relax at the pool anytime. How quickly the sun will rise or set depending what kind of season you’re in. Also the light, sunset, sunrise and their effects will be slightly different for each season. 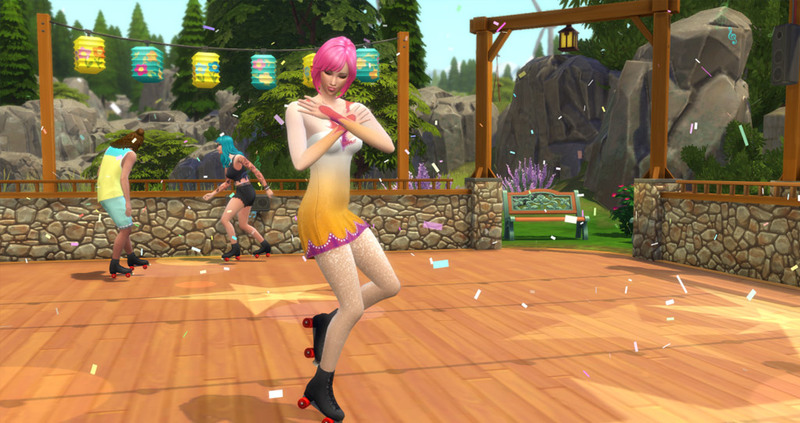 In the spring your Sims can enjoy a variety of new things. Flowering trees when you place trees from the gardening collection for example. The Roller Skating Rink will be active during the spring. Get a cupcake from the cart that pops-up somewhere in the world and enjoy a later sunset. The weather will most likely be clear but it can rain from time to time. In the summer you’ll find Roller Skating Rinks in your neighborhood and water balloon buckets around the town to cool your Sims off. You can also get an ice cream at the ice cream cart in your world. The days will last much longer in summer. The weather will most likely be clear and sunny, but watch out because heatwaves and thunderstorm can also occur. When the fall season is active the leafs on the trees will change into a more red/brown color. The trees will start to lose their leaves and your Sim can now Rake the Leaves that will create a Leaf Pile. The Leaf Piles comes with new activities; play around in it, set it on fire, Throw them Away and you can even woohoo in the leaf piles! Go get an apple cider from the cart and skate around on the Roller Skating Rink. The weather is mostly rainy with an occasional sunny day. The trees and all the objects turn white, the lake will freeze and even your windows are getting frozen. Watch your step because it’s easy to slip and fall with all the ice and snow. The day’s are shorter and the nights longer. When playing in the winter with your Sim all the Roller Skate Rink will turn into Ice Skating Rink. Make sure to check your thermostat or light the fireplace because if you don’t do this in the winter your Sim will get cold inside the house. To warm up when outside your Sim can get a hot cocoa at the cart. Snow and Blizzard storms will naturally occur in the winter. Your Sim can enjoy different activities depending on the current weather. Your Sim can also benefit from special traits you can buy in the rewards store. You can find the rewards store by clicking Aspirations (G). Each Season and weather change comes with new activities in your neighborhood. When it’s cold outside your Sim should still wear warm clothing. The sky may be clear but it’s still very cold. Turn up your thermostat at home to make them feel warm again. Sims with the Iceproof trait aren’t affected by cold weather and can safely walk outside while Sims with the Cold Acclimation still feel the effects. You can get this in the Rewards Store or use a cheat. Vampires are immune to cold weather. It’s raining! Better take out that umbrella… or use the rain as a free shower. Make sure you take your electronic devices inside your house when it rains, they can break. This counts for DJ equipment, fridges, stereos etc. With the Waterproof trait your Sims do not get wet in the rain. You can get this in the Rewards Store or with a cheat. After it stops raining and the sky becomes clear and sunny during the day a rainbow will appear for the next 2 hours. Sometimes you’ll have to move around with the camera to see that beautiful rainbow. 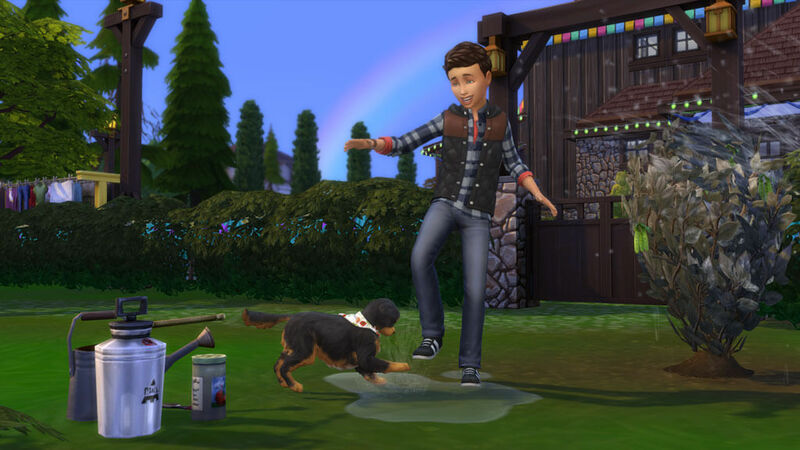 Sims can play in mud puddles, yes even toddlers! But watch out, Sims can also slip in a mud puddle and they get a tense moodlet from being dirty. Sims who are in love can now kiss in the rain as a new interaction. This will make your Sims feel warm. Have a mud fight. Kids can also join in on this activity. Your Sims can shower in the rain, naked. This actually increases your hygiene level really fast. Playing in the rain will increase your Sims fun level. Vampires can safely walk outside. Oh no! a thunderstorm, quick get inside. If Sims stay outside while in the middle of a thunderstorm they will feel tense. A Sim who has the Stormchaser trait will get a positive moodlet while in extreme weather and won’t get tense. You can get this in the Rewards Store or use a cheat. Sim can be struck by lightning and this will give your Sim a +40 Dazed moodlet or if it happens twice it will kill your Sim. Umbrellas can invert and then they will break while walking outside in a thunderstorm. You can’t use that umbrella for a while but you can always get a new one from the umbrella rack. When lightning strikes on the ground it will sometimes leave rare collectibles for your Sims to claim. Thunderstorms can break electronics when left outside of the house. If your Sim is really unlucky and got hit by lightning twice, there’s a chance they will die or they will get the hypercharged moodlet. This gives the Sims lightning bender powers. If it’s starting to snow it will take a while until the landscape, trees and houses turn white. It’s important for your Sim to stay warm in these cold days. If you make it comfortable at home by turning up the thermostat while snowing, your Sim gets a happy moodlet just for being comfortable. Sims with the Iceproof trait aren’t affected by snow and cold and can safely walk outside. Sims with the Cold Acclimation trait aren’t affected as much by chilly weather but will still feel the effects. You can get these traits in the Rewards Store or use a cheat. Make Snow Angels on the ground with your adult or child Sims. There’s is a very funny mischief interaction that’s called shove snow. Use it on a Sim to rub a snowball in their face. Have a Snowball Fight with the whole family, this will increase their social, fun and their relationship. If you click on a snow pile you can remove it when you select Shovel Snow. Sometimes they will block a door or stairs so Sims have to remove them to go outside. Kids have the ability to play in the snow, they will give them a playful moodlet. Do you wanna build a Snowpal? When there’s enough snow in the ground your Sims will have the ability to build a Snowpal. There are different Snowpals your Sims can build, some emotions will have effect on the outcome. Kids can build relationships with their Snowpals and even name them. If you want to get rid of the Snowpal you can destroy it. Sims will walk outside to react to first snow at the end of fall or beginning of winter when snow will fall for the first time. Vampires can safely walk outside and won’t be affected by the cold. You’ll know when there’s a blizzard happening when the temperature starts to drop to the lowest level. Sim become tense when walking outside in a blizzard storm and can sometimes slip and fall into the snow. You can’t fish during a blizzard because the lakes will be frozen and way too cold for fish to show up. You can always travel to another location where it never snows like Oasis Springs. Even Sim with the Iceproof or Cold Acclimation trait get tense when they’re outside. The only way to enjoy a blizzard storm with your Sim is to get the Stormchaser trait. This will make them excited about extreme weather. You can get this in the Rewards Store or use a cheat. You won’t find a cloud anywhere in this weather. These are the best conditions to walk outside with your Sims. They won’t get affected by the weather and they can safely swim in the swimming pool, go skating or have a nice dinner at the patio table. The perfect time to wear clothing from the hot weather category. Or you can just wear your normal clothes and you can turn the thermostat cooler in your home, this will work like an air conditioning. Sims with the Heat Acclimation trait aren’t affected as much by hot weather but will still feel the effects. You can get this in the Rewards Store or use a cheat. 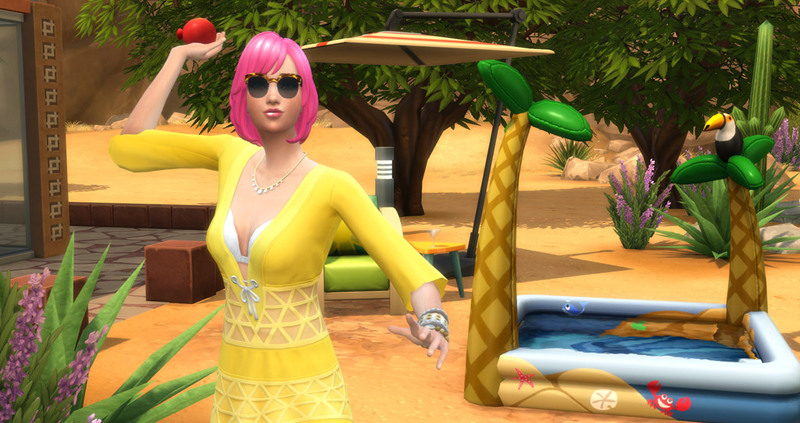 It’s a bit too hot to ago outside but you can cool your Sims off with fun activities! Sims who have the Heatproof trait won’t be affected by a heatwave while wearing warm clothes so wear anything you like if you have this trait. Sims with the Heat Acclimation trait aren’t affected as much by hot weather but will still feel the effects. You can get these traits in the Rewards Store or use a cheat. Jump in the pool. This will keep your Sim at just the right temperature. Have a water balloon battle in your yard of the park, this will help your Sim to cool off. Cool off toddlers by using sprinklers or place them in the kiddie pool. When you’ve got mysterious weather on your forecast you’re in for a treat! Anything can happen, thunderstorms, rain, hot weather and even snowstorms in Oasis Springs for example! Previous ArticleOfficial The Sims 4 Seasons families downloadable now!Next ArticleGlitches appearing massively after The Sims 4 Seasons launch!